I don’t know about you, but this weather is making me think sunny escape ASAP! This holiday season, in honour of Delsey’s landmark 70th anniversary, we’re launching a contest to give one lucky reader a spiffy silver Caumartin spinner! In case you’re not familiar with the Parisian brand, Delsey was co-founded in 1946 by Émile Delhaye and the Seynhaeve brothers. The company began producing leather cases for cameras and photo gear, gaining worldwide loyalty over the decades to follow. Recent developments include 2015’s Pluggage, a smart suitcase with built-in electronic gadgets (locator beacon, weighing scale, wireless speaker, remote locking, phone charger) that communicate with a smartphone app. The current lineup includes a wide range of travel bags, briefcases, cabin baggage and hard cases in all sizes and colours. 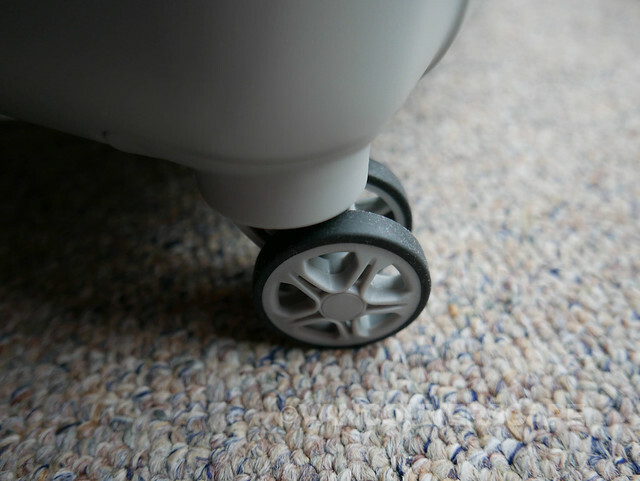 I’ve been using their Helium Breeze 4.0 carry-on spinner trolley for years. The Caumartin is super lightweight, contains double spinner wheels to whizz about the airport and is made from durable Markrolon® Polycarbonate material. 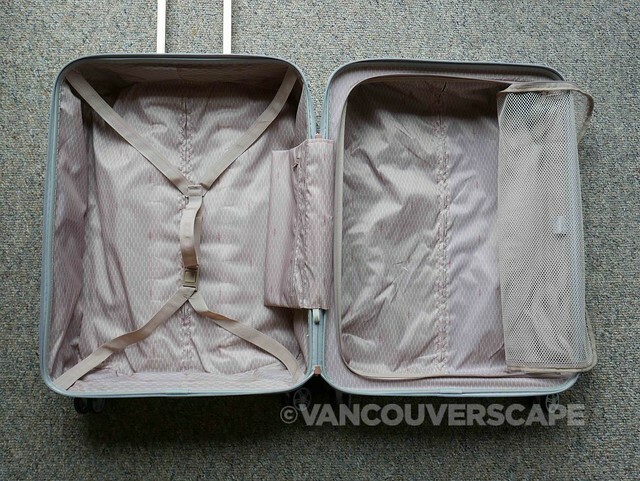 It comes in three sizes: 19” carry-on, 24” spinner trolley and 28” spinner trolley. 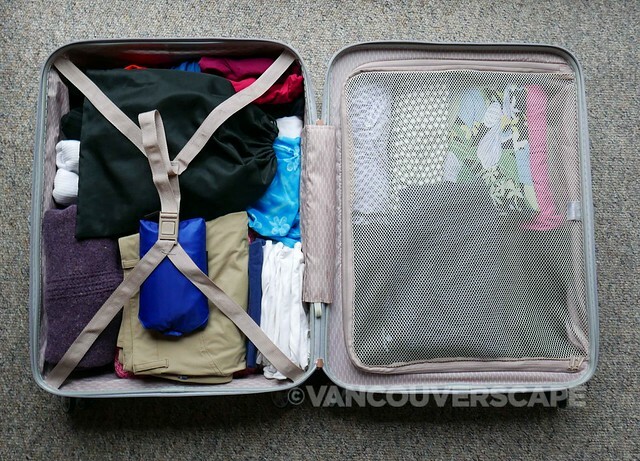 When unzipped, you’ve got two fully-lined packing compartments with a zippered mesh divider on one side and adjustable tie-down straps on the other. 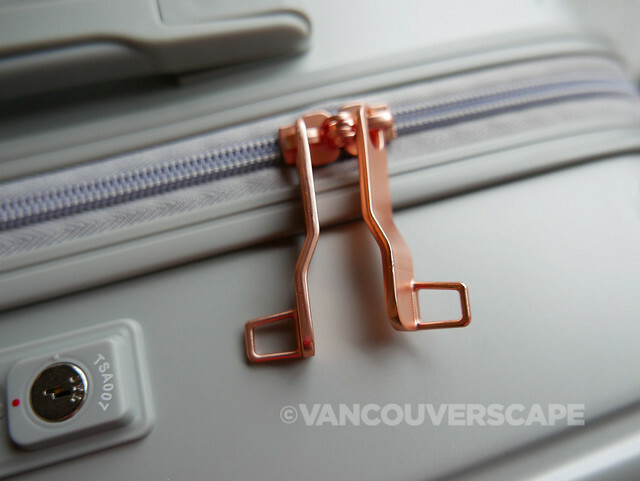 I love the rose gold zipper pulls. 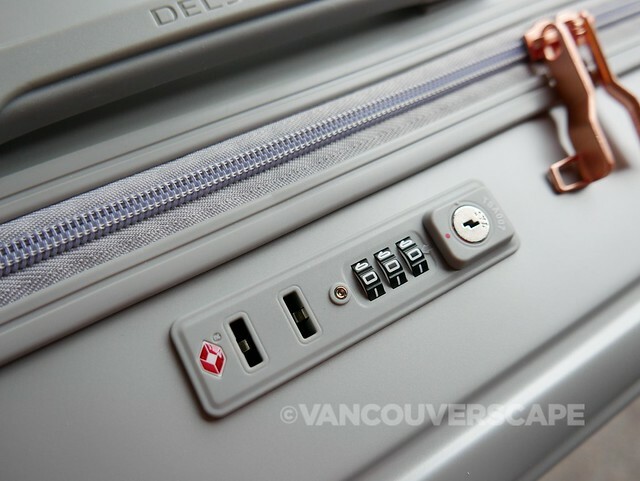 The three-digit TSA-accepted lock can be set with your own personal code. These modern locks alert TSA screeners to use secured tools to open your lock without causing damage to your suitcase. There’s two soft-touch handles (top, side). Delsey’s team have taken their suitcases through vigorous tests: rolling, on stairs, drop chutes, closures, abrasion and lifting – over 35,000 cycles – to make sure these super light pieces keep doing their job year after year (there’s a 10-year worldwide limited warranty included). 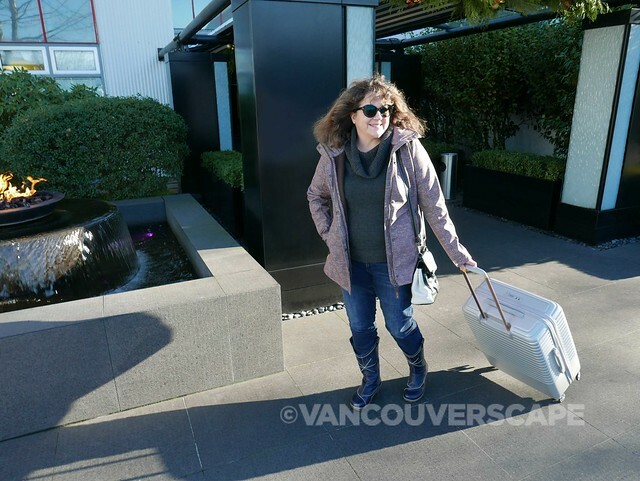 The Caumartin is available in Black, Blue and Pearl Grey and retails for CDN $240 (Carry-on Spinner Trolley), $280 (24” Spinner Trolley) and $330 (28” Spinner Trolley) via better luggage retailers in-store, online and in Vancouver at Vancouver Luggage Warehouse. We’re giving away a 24” Spinner Trolley in your colour choice, a $280 value! We’ll draw a winner on December 19 at 5 pm. Good luck to all entrants! CONGRATS TO OUR WINNER MICHELLE MATTA! 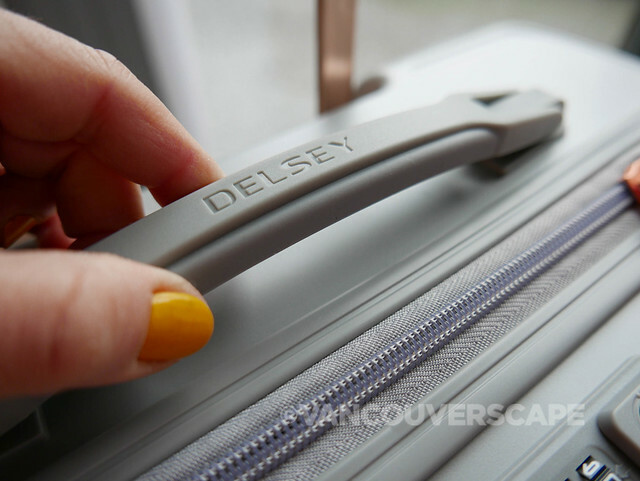 SAFE TRAVELS WITH YOUR SHINY NEW DELSEY TROLLEY. I would love to win this luggage! Favourite destination this time of year Believe it or not is Ontario because that is where my family is and I miss them at Christmas ? My favourite winter destination is Victoria. I like their Christmas over there. My favourite winter destination is Kelowna for some fun skiing. I’m @silverweave on instagram. The best winter destination is Banff! The best winter destination is Orlando Florida, who’s heart doesn’t live there?! Boston is my favourite winter destination ? Maui for the sunshine, sandy beaches and fresh pineapple ? Hawaii is my go-to place!